To begin: HUZZAH! Thanks to the tireless efforts of America’s diplomats, St. Lucia has become the 100th state to endorse the Proliferation Security Initiative (PSI). PSI participants interdict illicit transfers of weapons of mass destruction and missile-related items, and strengthen legal authorities to conduct interdictions. Now the fact that St. Lucia is a tiny island country in the Caribbean of only 238 square miles with a population of 174,000 is irrelevant. They will not be acquiring WMDs, and thus it will be unnecessary to invade them. Scratch one off the “To Do” list. And you all thought those Caribbean embassies didn’t do any work. Shame. 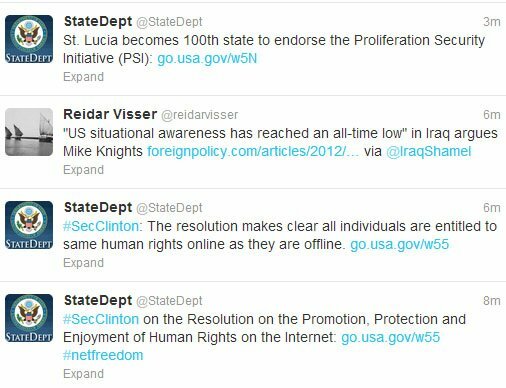 Slipped in between self-love Tweets by State is a note that the US has no freaking clue whatsoever about what is going on in Iraq. Though the State Department Twitterers failed to touch on the subject, the linked article notes “Despite the massive US Embassy in Baghdad, US government personnel have minimal freedom of movement due to security concerns and skyrocketing Iraqi government suspicion of any foreign information-gathering activities… US intelligence agencies in Iraq have also found themselves unable to maintain relations with the prickly and increasingly powerful civilian intelligence agencies in the country.” Oops, sorry ’bout them nine years of war and occupation Iraqis, but Happy July 4th! Wait, that is actually true. OK, here’s the ironical bit: “The United States was proud to work with the main sponsor, Sweden… to stand with our partners to address challenges to online freedom, and to ensure that human rights are protected in the public square of the 21st century.” Hah hah uninformed people, it’s funny because Sweden is trying to snare Assange for the US. Meanwhile, Hillary’s running dog Alex “The Innovator” Ross is burping out positive vibe Tweets with the hash tag #netfreedom in support. We’ll add a few choice comments to the feed with that same hashtag to keep things in balance later this morning. Whew, there you have it, one blast of Tweets to ruin your whole day. Anything new on Tom and Katie’s divorce by the way? Please refrain from referencing mindless tweets from the birdbrains at State while I’m having my breakfast. If you didn’t mention them no one would know they even existed. Mom’s advice to wait 30 minutes before reading blogs after meals still makes good sense. Thank you for not letting the travails of TomKat get buried underneath these weighty State tweets. People have need of the lighter side too, y’know! What about Suri (or, Siri)? What about Scientology and — hey — where’s L. Ron Hubbard? Isn’t that his baby? Well, I mean Scientology, as a church. Is it a church? Some say “cult”. What’s the difference? Can we do this in a tweet? That link is a great one, the article hits the nail on the head on the problems with tweeting. The tweet excerpt about the trips to Iceland and Armenia begs the question: just who is the targeted audience for this malarkey? Are Iraqis, Afghans, and Pakistanis, for example, expected to gather around reading such tweets and discussing with the utmost concern, and with an eye on the future, what articles of clothing this overpaid tweeter left at home in the US? Is ‘dashing’ to Iceland something the average person in Iraq, Afghanistan or Pakistan could relate to?